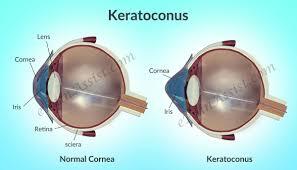 The term keratoconus is derived from two Greek words: "kerato", meaning cornea, and "konos", meaning cone. Keratoconus is a disease of the cornea in which the cornea loses its natural round shape and becomes distorted with cone-like bulging, progressive thinking, and an associated reduction in visual quality. 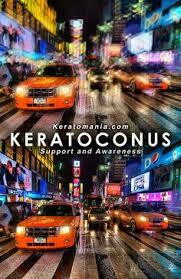 Keratoconus is a progressive disease that can range from very mild to very severe. The progression is generally slow and may stop at any stage. Keratoconus is one of a group of corneal degenerations that is characterized by corneal thinning. These conditions are termed "Ectasias" of the cornea. Although we have been aware of keratoconus for over two hundred years, we are still not certain about the cause of keratoconus. We are fairly certain that it is genetically programmed and family history is a risk factor. About 7% of patients with keratoconus have known relatives with the disease. Generally speaking, there is about a 1 in 10 chance of a patient with keratoconus having an offspring with the disease (unless there is evidence of keratoconus in successive generations, which increases the probability level). Additionally, there may be links to the endocrine (hormonal) system in that keratoconus tends to appear in its early stages at puberty. Associations with allergy ("atopy") are common as well. Currently there are a number of studies going on in terms of determining the underlying causes and associations of and with keratoconus. The incidence of keratoconus is not well known, but an approximation is that about 1 in 2,000 persons in the general population have keratoconus. This is a relatively high number in terms of disease rates. Keratoconus is a relatively common eye disease. With new technologies that measure the shape and thickness of the cornea in exquisite detail, we are now able to detect the presence of keratoconus well before subjective symptoms develop. Corneal Topography has become the standard of care in diagnosing keratoconus. A computerized system images the shape of the cornea by taking tens of thousands of data points from the corneal surface. The results are instantly analyzed and a topography map is generated. The colors of the map correspond to the shape of the cornea. In keratoconus the cornea tends to be very steep in shape and quite irregular in shape. Quantitatively the topography values can be monitored for change over time to determine if the condition is progressive. Broward Eye Care is proud to use the state of the art corneal topography and analysis system in the world today, Oculus Keratograph Corneal Analysis. At some point in the disease process your doctor will note visible thinning of the cornea under the biomicroscope along with folds in the cornea (called "striae"). Other clinical signs include the deposition of iron in the cornea ("Fleisher's Rings"), corneal scares, large increases in astigmatism, and reduced correctable vision with glasses. Patients complain of distortion and progressive blur of their vision along with large and frequent changes in their prescription. During the very early stages of keratoconus, conventional eyeglasses can correct the mild myopia (nearsightedness), and astigmatism that develops. At these stages vision is often correctable to 20/20. As the disease progresses a loss of best corrected glasses vision occurs. It is then that special keratoconus contact lenses are required to achieve clear vision. The contact lenses function to "mask" the irregularity of the corneal surface, thus increasing the quality of vision in comparison to the vision through glasses. For many years the only method to correct vision well in keratoconus was with the use of hard contact lenses and then eventually rigid gas permeable contact lenses. Broward Eye Care is one of the few specialty contact lens practices to have extensive experience in fitting sclera contact lenses for the management of keratoconus and other medical eye conditions that require contact lenses. Scleral contact lenses are large diameter gas permeable lenses that vault the cornea and align to the peripheral sclera of the eye. Since there are few nerve endings on the sclera, the lenses are very comfortable (even from the initial time they are placed on the eye). The vaulting of the cornea leaves a healthy tear layer between the back of the lens and the front of the cornea. This prevents any lens induced irritation or discomfort on the corneal surface and promotes excellent “wetting” of the front of the eye. These lenses are custom fit to the eye based on the anterior shape of the eye (determined at Broward Eye Care by corneal shape analysis obtained via Pentacam technology). We utilize numerous sclera lens designs and laboratories which are selected based on the specific requirements of the individual patient. SynergEyes laboratories specializes in the development of hybrid contact lenses that have a highly oxygen permeable central area and a soft periphery. The goal is to provide the crisp optics of a rigid gas permeable lens and the comfort and positioning stability similar to a soft contact lens. The most recent development in hybrid designs is the UltraHealth lens. The UltraHealth has unique geometry of both the rigid center and soft periphery. The result is a lens that vaults the central cornea and aligns with the soft periphery from the peripheral cornea out to the sclera. The lens has excellent centering, movement, and comfort characteristics. We have been able to fit patients with keratoconus who have failed at many other lens designs. The doctors experience has allowed thousands of keratoconic patients to achieve clear vision, when less experienced lens fitters had failed. Broward Eye Care receives referrals for the treatment of keratoconic patients from throughout the United States and South America. Cornea Transplant Less than 10% of patients with keratoconus progress to the point where contact lens treatment is insufficient to correct vision adequately or contact lens intolerance develop. These patients require some form of corneal transplantation. Eye banks in most major cities have a great supply of corneas for transplantation, so waiting on a recipient list is generally a thing of the past. Corneal transplantation is one of the most successful forms of organ transplantation. Rejection of corneal tissue is relatively infrequent and is very successfully managed with topical medication eye drops. 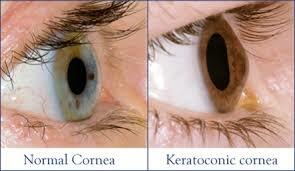 The outcome for corneal transplantation in cases of keratoconus is very good. Following corneal transplants, most patients do require glasses and often contact lenses for proper visual correction. Should any of our keratoconus require corneal transplantation, your doctor will make the most appropriate referral for you. INTACS for Keratoconus are small arc shape implants that can be surgically placed within the corneal tissue to effect a purposeful change in the surface shape of the cornea. Initially developed for the correction of myopia (nearsightedness), doctors began to utilize Intacs for certain cases of keratoconus to provide a relatively more regular front surface. This allows for some degree of improvement in vision and in some instances, more stable contact lens fitting. There are certain specific criteria that make a patient with keratoconus a candidate for Intacs. Your keratoconus specialist at Broward Eye Care is able to make that determination. Collagen Cross Linking with Riboflavin (C3-R) New research indicates that keratoconus may be treated with a procedure called Corneal Collagen Cross-linking with Riboflavin (C3-R®). This is a new treatment that increases the stiffness and rigidity of the cornea and stabilises ectasia. Some patients who previously had progressive ectasia have now been treated and followed for up to five years without evidence of any further change in their condition. At present it is not known whether the stabilising effect of C3-R® on keratoconus is permanent, but the C3-R® treatment could potentially be repeated if it was necessary. The bulk of the cornea is made from collagen fibers which are arranged in bundles. The strength and rigidity of the cornea is partly determined by how strongly the fibers are linked together. Over the course of a lifetime the cornea becomes progressively stiffer due to natural cross-linking between the fibers. Studies are currently taking place which are evaluating the safety and efficacy of C3-R for keratoconus. The hope is the C3-R may allow us to slow down or halt the progression of the disease.